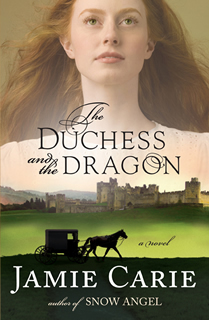 Rising romance novelist Jamie Carie’s second book, The Duchess and the Dragon, tells the epic story of two unlikely soulmates who live worlds apart but soon meet and turn each other’s world upside down. Drake Weston, Duke of Northumberland, is accustomed to a life of royalty until a tragic mistake followed by murderous rage results in his darkening character and sudden flee from England. With a hoarde of money on which to survive, Drake hops a ship of indentured servants to America but is duly robbed and taken ill by the merciless sea voyage. In Pennsylvania, Serena Winter is a humble, devoted Quaker on a mission of mercy, ready to tend the sick people aboard a ship that has just arrived from England. Taken by Drake’s air of dark mystery after he begins to serve as an apprentice to her silversmith father, Serena falls in love and is excommunicated by her fellow believers when she accepts a non-Quaker’s marriage proposal. Not knowing Drake’s history, Serena is later shocked to discover her new status as a duchess. What follows are hard truths and softening hearts, romance triangles, webs of deceit, and ultimately, the power of grace, love, and passion.